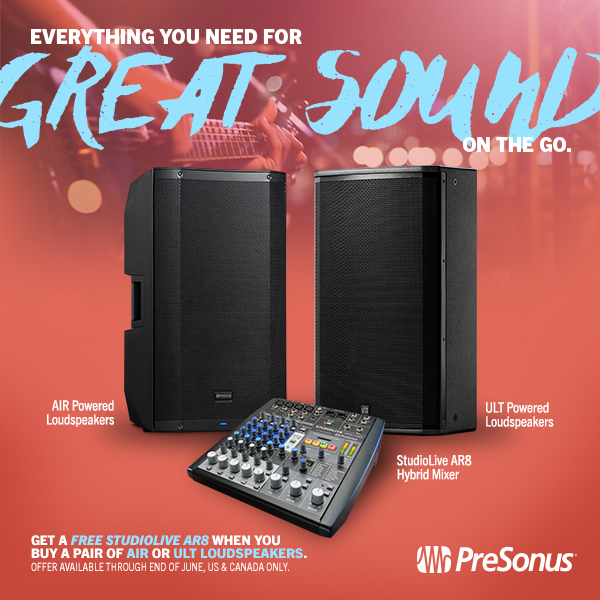 Buy a pair of AIR or ULT Loudspeakers, get a StudioLive AR8 mixer FREE! From now until the end of June, customers in the USA and Canada can take advantage of this incredible offer—we’re giving you a StudioLive AR8 Hybrid Mixer if you buy a pair of select PreSonus speakers. This will give you everything you need for a portable live sound rig short of mics and cables, and is ideal for DJs, electronic musicians, or just a general purpose PA system. Posted in Promo / Discount | Comments Off on Buy a pair of AIR or ULT Loudspeakers, get a StudioLive AR8 mixer FREE!